I'm trying a number of different categories of books lately, because I'm getting through far more than previously. One category I thought it would be interesting to pursue where the conversation/influence areas. 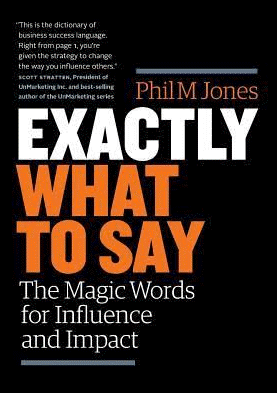 One that caught my eye was Exactly what to say: The Magic Words for Influence and Impact by Phil M Jones. This was quite interesting but I'm not sure if I liked it or not. In this book, Jones takes you through a number of situations, where people often say the wrong thing and make things worse, or where they don't even know what to say, and he gives formulas for how to structure responses that turn the situation back around the way you want, to keep heading to the right outcome. I have no doubt he's right in what he says. But having been on the receiving end of many of these discussions, generally as part of fairly strong sales routines, even though it might have helped the seller move in the direction they want, I'm pretty resistant to much of this, and can generally tell when I'm being played or manipulated, and that's what many of these techniques make me feel. Do I think these types of tactics work well across the broad community? Yes, probably. Jones has covered quite a bit of ground in the book, and many different situations, and you can tell that he's put a lot of thought into the responses. It might even be a US vs Australian thing, but I still think many would feel very manipulated by the techniques being applied to them. Reading it felt like I was in a highly-motivated selling techniques class, even though the subjects covered were much wider than selling-related ones. Bottom line: If you deal with the general public and need to find an appropriate way to respond to a variety of situations, you might find this useful. It felt a bit too slick for my liking but Jones is clearly good at what he does. Next Next post: Learning Mandarin: What is Singles' Day?